Funeral Services program for Leatha Walker (1889-1976), the sister of Pilgrim Black (1905-2002) and the aunt of Patricia Ann Black (1956- ). The services were held on March 6, 1976, at the Mt. Moriah Primity Baptist Church, located at 1101 South Locust Avenue in Sanford, Florida. Reverend J. S. Snelling presided over the service. Leatha Black was born on August 17, 1889, in Sanford to Harry Black (d. 1911) and Maggie Benjamin Black (ca.1870-ca.1934). She had four brothers and two sisters: Leckward Black, Mustar Black, Malachi Black, Pilgrim Black (1905-2002), Margaret Black Jones (1889-1976), and Harriett Black Lawson. As a child, she attended Seminole County Public Schools and was a member of the St. Paul Missionary Baptist Church. As an adult, she joined the Mt. Moriah Baptist Church under the pastorate of Reverend E. Bullard. Leatha married Reverend Robert Bradley and had one child with him, Reverend Israel Bradley Black (ca.1913-ca.2007). Several years later, Leatha married Reverend A. W. Walker and had four children with him: Joell Walker, Carrie Walker Oliver, Clementine Walker Barnes, and Harry Walker. Leatha was also a member of Rebecca Chapter 83 of the Order of the Eastern Star, a Freemason fraternal organization for both men and women. On February 26, 1976, Leatha Walker passed away at the Seminole Memorial Hospital, located at the corner of East First Street and Mellonville Avenue in Sanford. Her funeral services included speeches and performances by the Gospel Choir of the Hickory Avenue Church of God, Reverend P. Sanders, Reverend W. Brown, the Mt. Moriah choir, Deacon R. Zanders, Mother R. Wilson, Fernandina Beach, Sister Flossie Zanders, Mrs. Clyde Walker, and Reverend J.S. Snelling. Her remains were cared for by the Sanders Funeral Home and she was buried in the Light Foot Cemetery. Original program, 1976: Mt. Moriah Primity Baptist Church, Sanford, Florida: Private Collection of Patricia Black. Digital reproduction of original program, 1976: Mt. Moriah Primity Baptist Church, Sanford, Florida. Originally created by the Mt. Moriah Primity Baptist Church and owned by Pilgrim Black. Copyright to the resource is held by Patricia AnnBlack and is provided here by RICHES of Central Florida for educational purposes only. Crowley, John G. Primitive Baptists of the Wiregrass South 1815 to the Present. Gainesville: University Press of Florida, 1998. .
Joiner, E. Earl. A History of Florida Baptists. Jacksonville, Fla: Printed by Convention Press, 1972. Marital Status: United in Holy Matrimony to Rev. Robert Bradley and to that union one child was born; Rev. Israel Black. After many years she was joined in Holy Matrimony to Rev. A. W. Walker and to this union four children were born. Church Affiliations: As a child she was a member of the St. Paul Missionary Baptist Church. Several years later, she joined the Mt. Moriah Primity Baptist Church under the pastorate of Rev. E. Bullard. Organizations: Order of Eastern Star Rebecca, Chapter No. 83. Expiration: Thursday, February 26, 1976 at the Seminole Memorial Hospital. She leaves to mourn her passing two daughters: Mrs. Carrie Oliver, Sanford, Fla., and Mrs. Clementine Barnes, Melbourne, Fla.; two sons: Rev. Israel Bradley Black and Harry Walker, both of Sanford, Fla.; one brother: Mr. Pilgrim Black, Sanford; two sisters: Mrs. Margaret Jones and Mrs. Harriett Lawson, Sanford; two daughters-in-law and two sisters-in-law, all of Sanford. Also, 19 grandchildren, 12 great grandchildren and a host of nieces, nephews, relatives and friends. The family wishes to express thanks for all the acts of kindness extended to us during our hours of bereavement. May God bestow His richest blessings upon you. Baptist; Baptist Church; Barnes, Clementine; Beach, Fernandina; Bigham, Patricia Ann Black; Black, Harry; Black, Israel Bradley; Black, Leatha; Black, Maggie Benjamin; Black, Patricia Ann; Black, Pilgrim; Bradley, Robert; Brown, W.; Bullard, E.; church; funeral; Gospel Choir; Hickory Avenue Church of God; Jones, Margaret; Lawson, Harriett; Light Foot Cemetery; Mt. Moriah Primity Baptist Church; Oliver, Carrie; Order of the Eastern Star; Rebecca Chapter No. 83; Sanders Funeral Home; Sanders, P.; Sanford; Seminole County Public Schools; Seminole Memorial Hospital; Snelling, J. S.; St. Paul Missionary Baptist Church; Walker, A. W.; Walker, Clyde; Walker, Harry; Walker, Leatha Black; Wilson, R.; Zanders, Flossie; Zanders, R.
Mt. Moriah Primity Baptist Church. 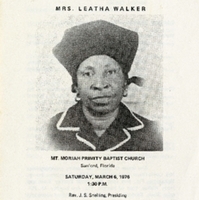 “Funeral Services for the Late Mrs. Leatha Walker.” RICHES of Central Florida accessed April 20, 2019, https://richesmi.cah.ucf.edu/omeka/items/show/2659.